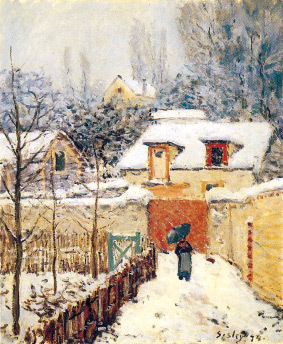 Impressionists in Winter: Effet de neige. Impressionist depictions of snowy scenes follow a long tradition of painting landscape in winter from the Limbourg Brothers in the 15th century and Dutch artists of the 17th century. Monet, Renoir, Pissarro, Sisley, Caillebotte and Gauguin all found inspiration in this subject matter which seems an apt one with which to end our Cafe Art series for 2010.